This is the original hanging Bubble Chair imported from Finland. In 1968, Eero turned the design world upside down with his revolutionary hanging bubble chair design - an inspired design that is still turning heads today. Have fun! 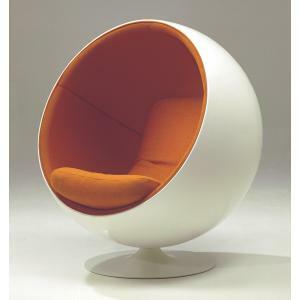 Eero Aarnio designed the Bubble chair in 1968. This acrylic sphere features removable non-slip cushions and hangs from the ceiling at almost any height. A 6' chain and snap hooks are included and this fits most ceilings but custom lengths are available. It should be hung 6" to 9" from the floor. It is made of smooth clear acrylic and a stainless steel ring. 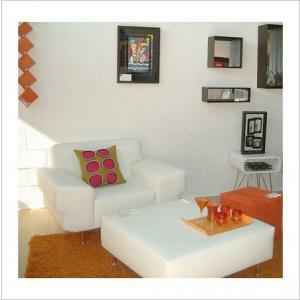 The cushions are stocked in silver or white(ivory) leather or COM may be possible. The Bubble Chair also impresses the sitter by its special accoustics. It swallows the sound and you feel peace and quiet even when it is placed in a crowded place. Eero Aarnio was - and still is - one of the modern furniture pioneers in using plastics, fibreglass, and acrylic in industrial design. Plastic material set the designers free to create every shape and use every color they wanted. This gave birth to objects oscillating between function and fun - and always fascinating ones. He said "after I had made the Ball Chair I wanted to have the light inside it and so I had the idea of a transparent ball where light comes from all directions. The only suitable material is acrylic which is heated and blown into shape like a soap bubble." This is the original design and the best quality since they have perfected the method of making it for over 50 years. The process of blown acrylic has been mastered and it creates a smooth and glassy sphere. Being connoisseurs of good design, we have seen inferior quality imitations like wavy, bubbly, and smoky acrylic(not clear as glass). The cushions are also inferior and don't stay in the bubble properly. The original uses stainless steel and inferior ones do not and it can become pitted. Professional installation is recommended. It is straight foward for any carpenter or handy-man. It can be hung in most construction materials and areas. We will help with instructions and guidance as we have hung hundreds of these.